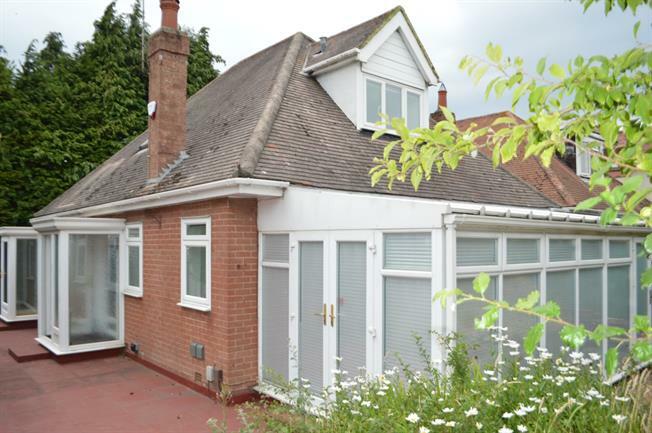 4 Bedroom Detached Bungalow For Sale in Bournemouth for Offers in excess of £325,000. Palmer Snell are pleased to offer this beautifully modernised 4 bedroom chalet bungalow with 2 reception rooms, 3 bathrooms and a large UPVC conservatory situated in a popular residential location in Bearcross close to schools, shops and good transport routes being offered with no forward chain. The accommodation comprises a porch, spacious entrance hall, 14'1" lounge, 14'1" separate dining room, 22'7" UPVC conservatory, newly fitted ground floor shower room and kitchen, 2 ground floor bedrooms, 2 further bedrooms on the first floor with en-suite to the master bedroom, a bathroom, UPVC double glazing, gas central heating, off road parking, garage and gardens to the front, side and rear. Via UPVC double glazed porch. Meter cupboard. Radiator. Stairs to first floor. Doors to accommodation. 2 UPVC double glazed windows to side aspect and French doors to conservatory. TV point. Radiator. Arch through to dining room. UPVC double glazed French doors to conservatory. Radiator. TV point. Space for table and chairs. UPVC double glazed construction. Glass roof. French doors to garden. 2 UPVC double glazed windows to rear and side aspect and door though a UPVC double glazed porch to garden. Range of wall and base units. Sink. Integrated oven, hob and hood. Space for appliances. Tiled walls. Radiator. L-shaped. UPVC double glazed window to rear aspect. Radiator. Frosted UPVC double glazed window to side aspect. WC. Wash basin. Shower in cubicle. Tiled walls. Heated towel rail. Velux. Loft hatch. Doors to accommodation. UPVC double glazed window to front aspect. Radiator. TV point. Door to en-suite. WC. Wash basin. Shower in cubicle. Tiled walls. Heated towel rail. Velux. WC. Wash basin. Bath. Tiled walls. Eaves storage house boiler. The property is situated on a corner with gardens to the front, side and rear. The front garden which has tall hedging to the border giving privacy from the road is mainly laid to lawn with flower beds to the borders. The side is mainly patio with a greenhouse to the side. There are double gates leading to a block paved driveway allowing off road parking leading to the garage which is to the rear.